In this second and concluding part of our feature on the history of the Irish language, we look at the role Irish has played in forging modern Irish identity. Contributors in order, Padraig Lenihan and Neil Buttimer, questions by John Dorney. Here we talk about the role of the Irish language in the construction of Irish identity since the 17th century. Padraig Lenihan argues that, initially, religion, in particular Catholic resistance to the Protestant Reformation, was more important than the Irish language in Irish self identity. Subsequently, Irish nationalism of the 19th century put more emphasis on shared historical experience. The crest of the Irish Confederate Catholics of the 1640s. 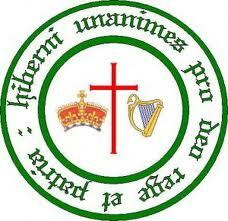 It says, in Latin, "Irishmen are united for God King and Country" - but not by language. Neil Buttimer talks about writing in Irish in the early 19th century and argues that, while there was some politicisation through the medium of Irish, most writing as Gaeilge was concerned with more immediate matters such as physical survival. 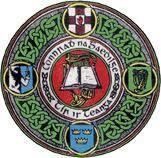 The crest of the Gaelic League, founded 1893. While Irish declined sharply in the late 19th century, there also arose a movement known as the Gaelic Revival, which aimed to save and to restore the language. Here we talk about how and why this came about and what effects it had. Padraig Lenihan argues that the movement happened a few decades too late to really revive the language. Neil Buttimer considers the Revival in the light of post-Famine Ireland, while Fearghal McGarry talks about the experience of Gaelic Revivalists on the ground in the early 20th century. An interesting element to come out of all three contributions is that while the Gaelic League did not reverse the dominance of the English language in Ireland, it may have succeeded in its primary aim, which was to prevent the extinction of Irish. Contributors in order, Fearghal McGarry, Neil Buttimer and Padraig Lenihan. 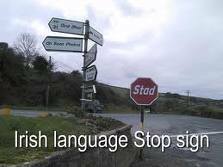 Finally, the Irish state, since 1922, has had as one of its stated objectives the revival of the Irish language. Here we talk about whether this has been, as Neil Buttimer puts it, “as qualified success or a qualified obituary” for the language. Ferghal McGarry, referring particularly to his biography of Eoin O’Duffy, talks about official hypocrisy and the use of compulsion to try to force people to learn Irish. Padraig Lenihan reflects on the effect not having a native language has on Irish distinctiveness. 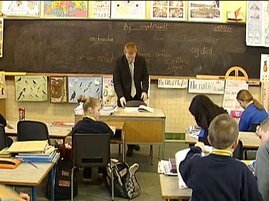 Children studying at Gaeilscoil, or Irish language school. The future of Irish? Written by: John_Dorney on 17 September, 2010.on 21 February, 2011. 3 Responses to "The Irish Language, Part II – A Phoenix from the Flames?" Great discussion. Your international comparisons were interesting, but I would really like to hear a comparison with Quebec, which used to have a confessional national identity which suddenly switched to a linguistic one. Likewise Ukraine. Great idea Kevin, maybe if we go back to this topic in the future we can address more international comparisons.